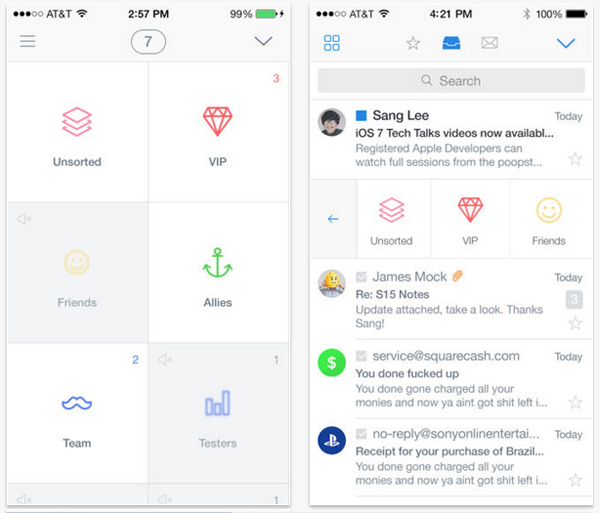 Launched today, SquareOne is another mail app that’s here to save the day and clear up all of your mess. The iPhone app is solely compatible with Gmail and works by getting you to divide your emails up into groups. It helps you out with some suggestions to start, but then you can reposition and rename them as much as you like. As you can see from the example above, groups like VIPS, Friends and Team are presented in a simple grid-like format. Once you receive an email, you can then swipe it to add it into a certain group and in future all emails from that person will be sent there automatically. You can also manage which push notifications you get from certain groups, which is a nice touch. Everything else SquareOne does looks good but is pretty standard for a mail app, it’s the sorting that it prides itself on. For some people this may work well and could ensure they’re more productive if they assign a time each day to tackle certain emails from certain group. However, now Gmail has its own super organised Categories functionality, SquareOne may need to add in something else to make it really useful to the time-saving, life-hacking crowd. You can download SquareOne from the app store here.